Prem Rawat has acknowledged that his techniques of meditation - the whole shebang - could be taught to everybody in 2 minutes on television. However, the response would be derisory laughter so people have to be "educated" beforehand by hours and hours of indoctrination especially as the techniques are no longer taught by shaven headed Indian guys wearing robes who impart the mysterious Eastern spiritual flavour. 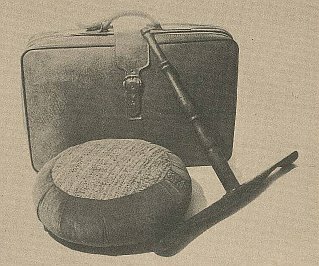 It may be that Indian peasants inured to hard labour and discomfort were able to practise these first two techniques that required arms held up and immobile without any problems but the coddled, drug-addled "Western" youth that were impressed by the young Maharaji found these techniques difficult or impossible to hold for even the required minimum of 15 minutes at a time twice a day. Therefore there was the widespread use of barragons / baragons / beragons to prop up their bodies. 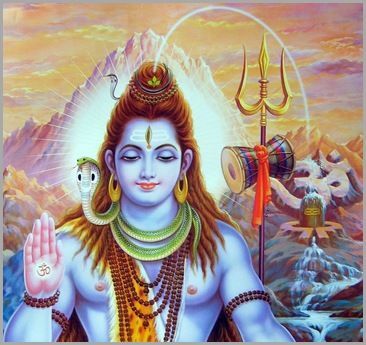 In premie gossip there was some identification of these beragons with Shiva's trident. This was no more fanciful than most other premie gossip. It doesn't take a very skeptical person to wonder how these physical techniques could dramatically change one's moods and emotions into 24 hours a day bliss. In fact, they didn't though certainly the religious and group experiences had by many premies were positive. Rawat nearly always criticised his followers' dedication and their obedience to his guidelines even if they lived in the ashram and religiously followed the ashram schedule. He told many absurd stories of premies under blankets "carving their beragons" instead of meditating. This has provided an excuse for each individual devotee for their failure to reach those constant blissful heights and the failure of Rawat's Knowledge to encompass the world as he predicted it would. 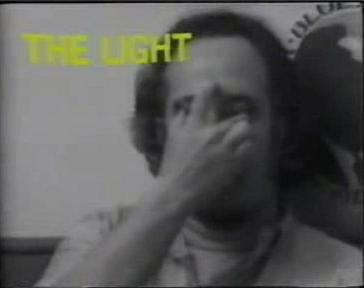 In the first technique, or Divine Light as it was formerly known, place your hands thus: the thumb and middle finger of your dominant hand stroke across each eyeball from outer corner to inner, coming to rest with a light but firm touch on the upper inner corner of each eyeball. Your forefinger rests in the middle of your forehead, just above the eyebrow line (your 'third eye'). 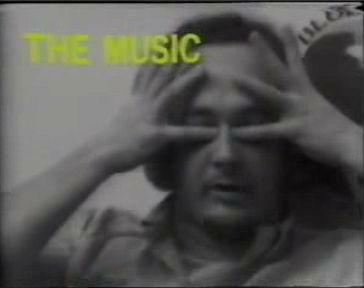 In the early 70's the mahatmas who gave people Knowledge on Maharaji's behalf, and who performed this technique on them, often used to press the eyeballs very hard. Certainly if you do press your eyeballs hard you see swirling colors, and premies used to think this was the Divine Light, rather than the neural entopic phenomenon that any child discovers when they squeeze their eyes. Later Maharaji gave direction to give Knowledge the 'gentle way', emphasizing that it was not the pressure on the eyeballs that counted, and the point of touching the eyeballs with the thumb and middle finger was simply to steady them to allow you to focus better. In the second technique, or Heavenly Music, place your hands thus: each thumb is placed in the ear and each hand is twisted upwards so that the four fingers of each hand rest on the top of your head, with each thumbtip lightly but firmly in each earhole, sealed with the twisting action. … premies if you don't get it, because we have been fooling around with something, because we've been thinking of something, because it's like many people sit in meditation, sometimes in a group meditation, they just don't seem that happy, they just don't seem that pleased, and other people say, well, Guru Maharaj Ji, I know he has been doing meditation because he sits up with us and gets up with us. And it's like that was the whole thing in Copenhagen, we were having all these meetings, and I said, if you lift one of those blankets up, you'll find a different story, they're not doing meditation, they've been carving their beragons, or thinking about something, or taking a nap, sleeping, but not doing meditation. To some premies it's a very egotistic thing, "Let's show 'em how long I can sit for meditation." They go and they sit by a wall, prop themselves up, put the baragon so that their hands will stay up, and go to sleep. They get so good at it, that they don't even have to have a blanket on them. They will be sitting just like they were doing meditation, but they will be asleep. All that is really not meditation. Yesterday I was reading this card some premies sent me. I opened it up and it's got this guy. And then it's got this whole story. It's a characterized story of this person whospaces out. And it's done pretty good and it's like … "Great. Fantastic." There is this guy and he is coming to satsang. And all of a sudden he decides that the person who isgiving satsang is a bore, and this person isn't in the vibe, and they don't know what they're talking about and stuff like that. "I'm going to go back home and do somemeditation." He goes out to his home and he says, "Oh, I better go have something to eat, that'll keep my stomach quiet, and then I can have something to …" Then he goes on thiswhole thing and he has a checklist in his head. Are the white pajamas on? incense on? Lights off? Baragon - $50 baragon or something like that (and it had a really nice namecalled a "Clear Light" baragon). And there's all these things. And then this guy gets into meditation. But then he dozes off and he leans against the wall. He goes to sleep,and he has a dream. And in this dream he has a monster. This monster is the mind. He's got this great big tongue sticking out. This guy's bald by now, he's got a sword. "I'mgoing to kill you. I can destroy you." And there is this mind. "I'm going to kill you, you monster!" And the mind goes, "What are you talking about? I could just swallow youwith my one concept." And it's like, "No, I'm going to kill you. I'm going to murder you." And then the next illustration there is this monster with his tongue out, rolled up,and this guy right in the middle moving inside the monster's mouth! And then all of a sudden the guy screams, "Help, Guru Maharaj Ji!" In the next illustration he's lying infront of the altar doing pranam. What a great story, you know? All I could think of was, "Poor premie who had to go through all that." The making of beragons became a cottage industry for premies but as far as I know there were no luxury $50 models. The quotes below are from official Divine Light Mission publications. 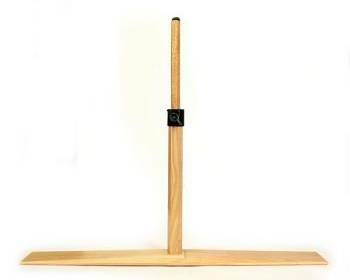 Barragons - Indian meditation stick helps lengthen meditation time - hand-cut hardwood in shape of water buffalo horns. Light stick meets dark stick. Send height, all sizes available. $9/barragon post paid. Money back guarantee. Charles Levin, 115 Bassett Ave., Brooklyn, NY 11234. The premies in Switzerland report on their recent national meditation retreat: "The army here gave us use of their barracks in Grindelwald for our retreat. Grindelwald is a well-known mountain village catering to the tourist trade, located us amidst a wondrous mountain world with snow peaks stretching up more than 4000 meters into the sky. 250 premies came equipped with colorful meditation sheets and barragons instead of uniforms and guns, preparing themselves for the age of peace rather than a new war. For the holiday-makers in the nearby hotels, the scores of people sitting under colored sheets just outside their windows must have been a sight for their sleepy eyes! Divine Music: you can play it yourself on a baragon. No experience necessary. (Though practice helps). We are in a place called Philadelphia. Or are we? In the hazy gray of a sunless morning, a day when the fog and smog seem a permanent part of the exterior landscape. we find ourselves checking into yet another hotel room, unpacking the baragons and the darshan clothes and the special photo which shows only his feet. Dave Ealing, otherwise known as the Jolly Green Giant when he turns out in his green prison garb, has most of the premies engaged in making wooden pendants and barragons in their houses (cells) - and they're silk-screening T-shirts as well. Matsqui Premie Products will soon become a legal business, which will mean that premies can work at this full time. MEDITATION TENT. Meditation tents will be available during the day in the orchard area. PUBLICATIONS/A.V. MATERIALS. Satsang tapes from the previous day's program will be available daily. 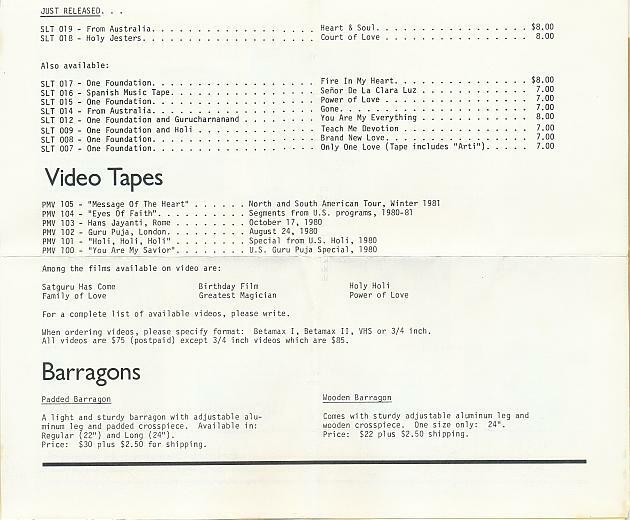 Also for sale will be: the new Elan Vital; a special Hans Jayanti issue of Divine Times; 16 new photos; tapes from the recent U.S. tours; a new Holi music tape; and adjustable barragons. Subscriptions to Elan Vital and Divine Times can be picked up in the Sales area, located in the Mall. GROUP MEDITATION will be held on the grounds in front of the main stage. Bring your baragon, blanket and reentry gear. Starts at 9 a.m. sharp. I know folks who quote mahatmas as saying, "you shouldn't use a baragon," and they don't. The trouble is, they don't meditate on more than two techniques either. If you're using your knees or skipping techniques, you ought to get yourself a baragon. Do yourself a favor. Even Lord Shiva is commonly seen with a baragon under his arm.These days, most cities have young craftsmen back into wood who'd be happy to make you something beautiful for under $20.00. you might as well have nice looking meditation tools, too, since you'll be using them from here on in. WORSHIP REQUIREMENTS: Each member is required to meditate formally twice daily and to attend spiritual discourses (satsang) nightly. MIUIMUM EQUIPMENT FOR WORSHIP: Though not required, many meditators use a blanket to cover themselves while meditating, to shut out disturbances and to conceal secret meditation techniques. They might also use a baragon, a "T" shaped tool to aid in technique. 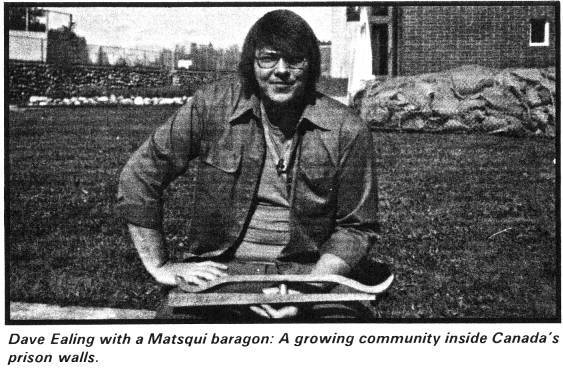 Barragons were still being sold through the official Divine Light Mission company, Elan Communications in 1982. Baragon. 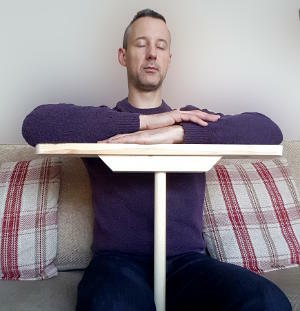 A T-shaped device used by a meditator to aid in meditation. Mahatman. An Indian term meaning "greater soul," which may be applied to outstanding spiritual leaders. Satsang. A basic (and required) Divine Light Mission service, or meeting, in which spiritual discourses are presented. 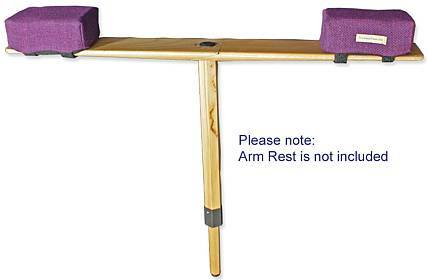 In the late 1980s, Prem Rawat forbade the use of beragons, or any form of arm rest, and the meditator was required to hold their arms up without support. This didn't make it any easier for the aging premies most of whom are in their 60's and cannot do this and certainly Prem Rawat has never publicly demonstrated that he can do it so they use their knees, armchairs, pillows or lie down on their backs to do the technique. It is amusing to think of these thousands of aging devotees suffering the pains of arthritis and sore shoulders for 30 minutes (the required minimum) every day while simultaneously trying to relax into some kind of transcendental experience. It is de rigeur amongst Rawat's "students" to attend "Knowledge Reviews" during which they must practice the techniques "correctly" and at least in the case of the 2nd or sound technique where everyone sitting behind them can see them and all this time, premies being people, pretend they are under no strain and do this every day and are in bliss. 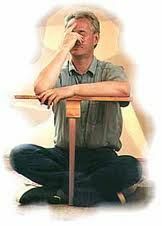 The beragon is a wonderful oportunity for the home handyman to create his own personalised meditation aide.